When the leaves come falling down in November and December that’s the time of year in Boulder County when buildings need to be winterized. But we do it all year round too as needed. Our crews are well-trained and competent gutter cleaning professionals. They all have great attitudes and a strong work ethic. Often neglected, your gutters serve an important purpose. Cleaning them once or twice each year (depending upon your situation and the proximity of trees) will often prevent damage to the structure of your house. In many cases it will also prevent flooding of your basement in heavy rains. Gutter cleaning prevents deterioration from water and mildew. If you’re in the mountains cleaning the pine and fir needles and cones out of the system is an essential task as recommended by fire fighters. They’ve seen fires start by dried conifer debris that can fill the gutters. We’re responsible for everything above the ground. This means the entire system so water flows unimpeded from your roof back to Mother Earth. We ensure that all of your gutters and downspouts are 100% clean and free of debris. Our experienced team is enthusiastic and passionate. We really enjoy helping out. Our prices are very reasonable because we’ve been seeking ways to complete the job more quickly for many years now. We pass the savings on to you. This is the time of year when Boulder County homeowners need to think about winterizing and I’m bringing this to their attention with a short gutter cleaning video. What’s cool is, that even though the gutter cleaning video was created for do-it-yourselfers, it also clearly demonstrates why we do a better job than many other companies. The crew at New Morning are competent gutter cleaning professionals, have great attitudes and a strong work ethic. Gutter cleaning is far more important than you think! Those little rifts lining your home or business are the very things that keep away streaks and smears on your walls and windows. Perhaps one of the most neglected features on your residence, they serve a great purpose. They prevent the deterioration that water and mildew cause on your home. Simply put, New Morning ensures that all of your gutters and downspouts are 100% clean and free of build-up. This build up consists of dirt, leaves, branches, and trash. Even if you don’t live near trees or shrubbery, you wouldn’t believe how much ‘stuff’ gets carried away by the wind and gently placed in your gutters. Have you looked at them recently? They probably need help, and we’re here to do the job. Our experienced team of workers is enthusiastic, passionate people. We enjoy helping you out. Our clients boast about how much energy and liveliness we bring to you as we clean your gutters. While it may seem like a simple, tedious task, it’s quite the strenuous project! What we offer is efficiency, excellence, and the right tools for the job. You wouldn’t even believe what we’ve found in long downspouts – a location hard to reach, we’ve got it covered. New Morning’s prices are far more cost-worthy than other local establishments. In addition to our great amount of experience, our speed and professionalism toward cleaning your gutters is top of the line. The next time you reach for the ladder and broom, pick up the phone and ask if we’re the right team for the job. It may so happen that your house is best suited for a trained, professional team of gutter cleaners. With clean gutters, the rain water will fall without obstruction. This prevents rust and sludge build-up in your gutters, reducing the need for gutter replacement or severe detailing. You’ll actually save money getting your gutters cleaned with us opposed to waiting until it’s too late. Rust drills through plastics, enamels, and metals a lot faster than an average person bothers to clean their gutters. A monthly or quarter-annually check-up by us will prevent that from happening and leave you feeling confident and worry-free. Ask about our Gutter Maintenance Specials! Not convinced yet? 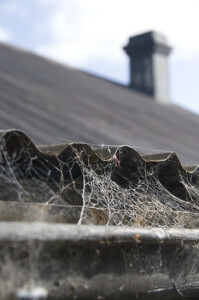 We’ve seen too many cases of neglected gutters. The water and filth built up so much that it caused that junk to seep into the home foundation and walls. This resulted in several companies being called to reverse the damage, and quite a few zeroes on their bill. Please don’t let this happen to you! We’re here to help, and we’re fast to act. Give us a call at (720) 466-3679 to schedule an appraisal and review. You won’t regret it one bit. This is why we’re here, and we are passionate about helping you and your home or business out. We look forward to hearing from you! I am glad to be able to show you why it’s worthwhile to come to us for your window and gutter cleaning needs.